The ultimate business card experience! 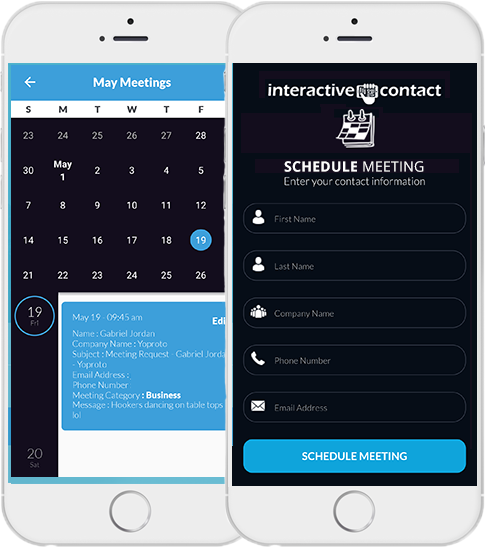 Send anyone your Interactive contact via SMS or email and allow them to schedule private meetings with you from within their mobile phones address book. Put your Interactive QR code on your business card and control it in real time. Send anyone your Interactive Contact via SMS in seconds with a digital version of your business card with a download link to save and update their address book with all your contact information. Your Interactive Contact dashboard and digital business card can be viewed in 5 languages! English, Spanish, German, Italian and French! One QR code is all you need! Our Interactive QR code connects to our Interactive Contact mobile app and allows you to manage more than 12 different features in real time. Put your Interactive QR code on your business card and send it to anyone via SMS or email in seconds! Send anyone the digital version of your business card in seconds! 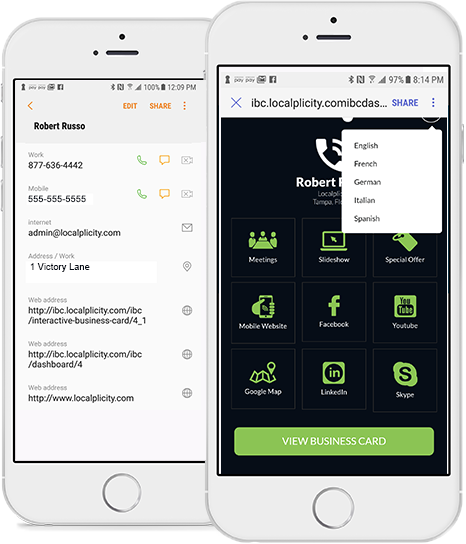 Our AMAZING app allows you to send your business card to existing contacts in your phones address book or new contacts with just a few clicks of our app. Capture business cards using our mobile app and store them in your business card library! Take a picture of any business card, finger crop it and its added to your business card library! A “NEW” BUSINESS CARD EXPERIENCE THEY WILL NEVER FORGET! TURN YOUR BUSINESS CARD INTO A MARKETING TOOL! 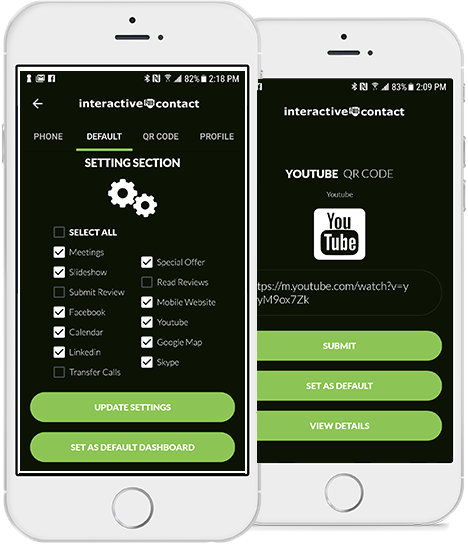 Our "NEW" interactive Contact App allows you to send your contact information and business card to any smart phone in seconds. Once your Interactive Contact is downloaded to any smart phone device they are INSTANTLY connected to your APP from within their own mobile phone’s address book! Your business contacts can connect to your app’s dashboard of features giving the ULTIMATE business card experience they will never forget! You never get a 2nd chance to make a 1st impression! Show your business prospects you are tech savvy, organized and that you use cutting edge technology to manage your business relationships! 30 DAY MONEY BACK GUARANTEE! TRY OUR APP RISK FREE! THEY WILL NEVER LOSE YOUR BUSINESS CARD AGAIN! THE ULTIMATE BUSINESS NETWORKING TOOL! Our "NEW" interactive Contact App with INTERACTIVE QR CODES allow you to have real time control of what features are show when people scan your business cards with ANY mobile device. Potential customers can scan your QR codes using their cell phone and you are in control of what they see! Become a business card technology guru! The ULTIMATE business networking tool! Most normal business cards are boring and get thrown away often! With our interactive business cards consumers have more reasons to keep you cards because they create a more powerful connection with the consumer and can be used to promote your special offers and slideshow presentations!